The glittering lights of ambience were emblazoned as the most happening personalities graced their presence at Hotel Shelter. . 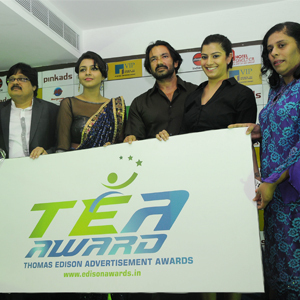 It was a moment of newfangled endeavour - The Logo launch of TEA AWARDS (Thomas Edison Advertisement Awards). The event commenced with the arrival of Mrs. Chitra Devi, Consul General of Malaysia. The honourable personality was floored by the spellbinding effort of Mr. Selvakumar of My Tamil Movie dot com.